Before last year, the last time Kuik Swee Boon performed on stage was in 2009. The artistic director of T.H.E Dance Company was on an informal hiatus from dancing, preferring to let his dancers take the spotlight. After sharing the stage with seasoned dancer-choreographers Albert Tiong, Jeffrey Tan and Kuik's wife Silvia Yong in the show Above 40, part of Esplanade's da:ns festival, he had an epiphany. "I realised I'd been too far from the stage. I had never really felt awake," says Kuik, 43, speaking to The Straits Times at the company's studio at Goodman Arts Centre. "On stage, I feel more alive." 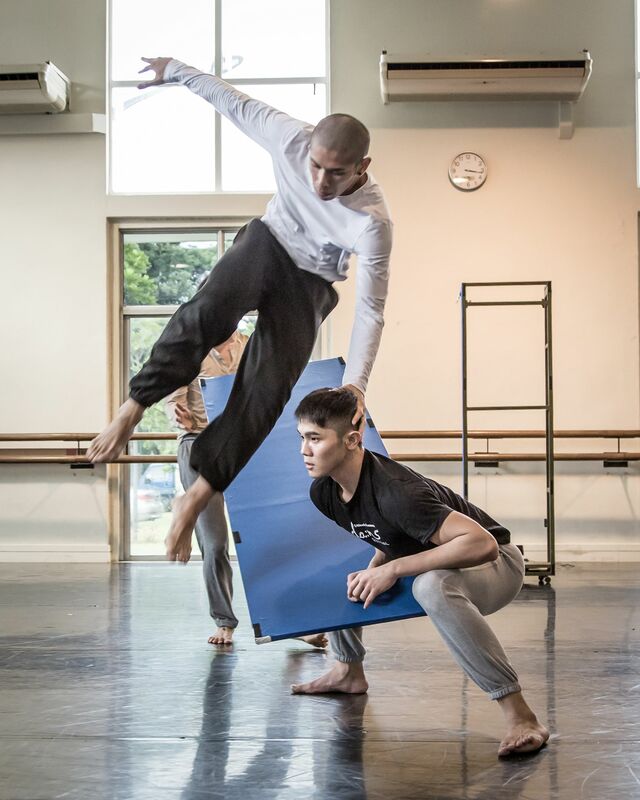 A preview of the company's upcoming double-bill show, Helix, sees him performing in a segment of his new work, titled Helix, In Progress. The show runs on Friday and Saturday at the School of the Arts' drama theatre. Plugged into earphones, Kuik cuts a quietly focused yet commanding presence as he pries apart a towering platform on stage, seemingly sundering body from soul. Also featuring seven young dancers from the company, the work is Kuik's attempt to describe what the eight-year-old company has been through, from challenging periods in the past to the forging of a distinct T.H.E physical style, and the addition of new blood to the company as old members left. For example, founding member Zhuo Zihao, 35, stepped down as a company dancer last month. While he is free to pursue independent projects, he remains an associate artist of the company. As part of the double-bill, Zhuo will resurrect an old work titled Against, an earlier version of which he created in 2009 and never presented because "maybe the concept was too challenging", he says. Against explores his thoughts as he leaves the company and passes down what he has learnt to the new dancers. He choreographed the work together with his wife Yarra Ileto, 34, who was also a former T.H.E dancer. The piece looks at issues faced by professional dancers, such as what it means to work as part of a team, and the sacrifices they have to make to pursue dance professionally. Ileto, who was born in Australia, admits that when she left the company in 2014, it was initially upsetting to watch other dancers perform her old parts. "I asked myself, 'Are we all the same? Are we just machines?'" she says. "I couldn't not have that emotional reaction." The piece is suffused with humour and candour. For example, in one segment, dancer Wu Mi earnestly announces that his life motto is that he likes to touch himself first before touching other people. The husband-and-wife duo do not perform in the piece, though Ileto does have a role as an announcer that introduces each dancer. Taken together, both pieces examine what makes T.H.E (short for The Human Expression) tick, as evident from its title which refers to the double helix structure in people's DNA. Kuik says: "Nothing stays the same. Things are always changing. Even in moments when you feel stuck, you are actually moving forward."